Mocked for their soft non-conference schedules, the Huskies get a shot at a big-boy SEC foe in the opener. But a loss to a good foe early is hardly a risk. It sure beats playing Idaho. One of the more exotic charms in the often dubious world of college football is the chance to play foes from planets never previously encountered. Sort of like the long-running Star Trek franchise, where opponents vary from cute and fuzzy Tribbles (Idaho) to the omnipotent Q (Auburn). Over more than a century of collegiate head-slams, the Huskies and the Tigers have never played one another. That makes the debut meeting Saturday in Atlanta (ABC, 12:30 p.m.) all the more intriguing, especially since Washington is ranked sixth and Auburn ninth in the Associated Press’s preseason poll. As cosmologists and college fans will tell you, Auburn comes from the Southeastern Conference, which is populated mostly by colleges in smaller Southern cities where foobaw is the only substantive entertainment beyond Popeil Pocket Fisherman commercial re-runs. The Huskies represent the Pac-12, where air kisses and algorithms are among the habits of the tony effetes. 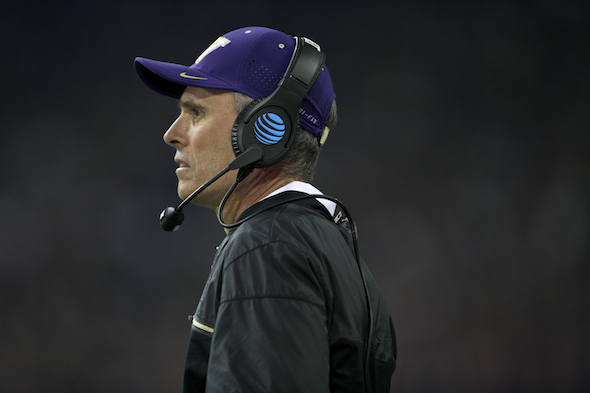 Even Huskies coach Chris Petersen has looked up from his playbook to notice. The one little nuisance with that is since the fans are indoctrinated when they are zygotes, they are persuaded they know more than the poor sap hired to coach the team. With many SEC football jobs, the new guy starts three touchdowns behind Alabama and is asked to explain himself. Petersen feels a little of that in Seattle, but most sports fans here get to choose among Seahawks, Mariners, Sounders, Storm, boats, mountains and sitting in traffic, so the Huskies are substantially less than the center of the universe. It’s true, although UW manages to have a football scandal about once a decade that leaks onto the home pages of national news platforms. So the Huskies do get some broader attention, even if they’re still stuck in the shadow of men’s and women’s crew. Culture clash aside, from a competitive football perspective, the match-up represents a decisive departure from UW’s recent history of scheduling non-conference opponents so weak that one of its broadcast partners, ESPN, mocked the Huskies a year ago as Cupcake U. The nadir actually was reached in 2016 when the Huskies’ non-conference bookings were Rutgers, Idaho and Portland State. The combined score was 148-30. Full ticket prices were charged, but in fairness, the band was good. The scheduling was largely a legacy of former athletics director Scott Woodward, who had the chore of rebuilding from an 0-11 season in 2008 under coach Tyrone Willingham. Woodward stooped to hire the youngest head coach in the NCAA, Steve Sarkisian, who had no previous head coaching experience. To help him, Woodward went all Betty Crocker on future schedules, which of course backfires once a team reaches the range of the New Year’s Six bowls and the newer playoffs. Petersen, Sarkisian’s successor, does not need training wheels, not after successive appearances against Alabama and Penn State in prestige bowl games. The Huskies have drawn their first opener against a top-10 opponent since the heyday of coach Jim Owens. In 1962, the No. 10 Huskies invited No. 7 Purdue to Husky Stadium for a 7-7 tie. Since 1989, the Huskies have opened against a ranked team 12 times, but five were conference foes. The seven others were No. 19 BYU in 1997 (W, 42-20), No. 11 Michigan in 2001 (W, 23-18), No. 12 at Michigan in 2002 (L, 31-29), at No. 2 Ohio State in 2003 (L, 28-9), No. 11 LSU in 2009 (L, 31-23), No. 19 Boise State in 2013 (W, 38-6), and No. 23 at Boise State in 2015 (L, 16-13). If BYU and Boise State are removed because of their lesser competition, that leaves only four openers with teams from powerhouse conferences over nearly three decades. That’s about once every seven years, which is probably all the early-season risk most coaches dare undertake these days. But is this really a risk for UW? The upperclass-dominant Huskies are heavily favored to win the Pac-12 title and have a decent shot at returning to the College Football Playoffs. They are mere 1½-point underdogs to Auburn in the heart of SEC country, suggesting that even a close loss early to a quality team will be a scratch on their final 2018 resume, not a dent. “It’s one game against a good team,” he said. “Win or lose, we have a bunch after that. No matter what happens, it doesn’t make or break our season. It just doesn’t. You have to indulge your questioners, Mr. P. The exotic species of a premier non-conference foe is encountered so rarely, it is seen as more formidable. You can’t have your cupcake, and eat it too. Of course, the cupcake tradition gets renewed….the very next game. But it’s a start. Every power team has at least one cupcake, usually two. But three is a diet only Monty Python’s Mr. Creosote could love. Mentioning that 2002 game triggered a flashback. 12 men on the field. NEUHEISEL!!! Then the dark times. Then the Willingham. I hope Huskies fans fully appreciate the renaissance from the dreariness of 10-15 years ago. Oh yeah. It makes me want to give Lambright a gift basket for how he was treated for a single 6-6 season. Almost a must win for the Dawgs. At the very least they need to keep it close and they should. They can’t afford to go mirror-universe and revert to the winless Huskies. I’m disappointed that a game with these two powerhouse schools involved on a neutral setting doesn’t get the College Gameday treatment. Gameday is fun for the participants, but as spectacle I’ve grown weary of it. Obviously the Huskies will have their hands full against mighty Auburn. But do I dare say it? A win would be so sweet! UW wins by at least a touchdown. Petersen has had nine months of prep. Out here in Alabama the Tiger’s are drooling for some Dawgs as a main course! I am confident the Dawgs will give a good scrap and y’all gotta remember when Missouri took on Alabama (ROLL TIDE!!) and won!! Huskies not nearly the underdog Missouri was. Yes. Petersen and the Huskies are simply hoping to live up to the high expectorations–err–expectations of mighty Aubrin and the mighty SEC. They will try to keep it within about 35 and hope no Aubrin players get too tired or injured. Entertainment beyond commercials for Popeil’s Pocket Fisherman? You forgot all about Extreme Catfish Noodling, Art. I defer to your knowledge of refined culture. Huskies need to be concerned about going from playing an opening game cupcake to actually becoming the cupcake. If Auburn blows the Dawgs out, snarky SEC types will rag the Tigers for ducking Central Florida. It will also deal a final blow to the much-maligned PAC-12, which will be forced to rebrand itself the “Conference of Cupcakes” and petition to become the western outpost of the Ivy League. Yes, on paper this looks like a competitive game. And the fact that it will be played in cosmopolitan Atlanta might help lessen the culture shock. But it’s still the Deep South, brutal heat and humidity, and a level of football passion utterly unknown in our civilized corner of the world. Plus there is nothing in the Husky DNA that is prepared to play a serious game against anybody before mid-October. And, lest we forget, the last innocent northwest coach who dared to wander off the reservation into Alabama was Mike Price and he lasted — what? — maybe three weeks. As Art suggests, the Huskies will have to rely on senior leadership and hope it proves strong enough to survive the initial onslaught. A big test for Jake Browning, coming off a somewhat disappointing rehab year made worse by the loss of a key receiver. Let’s hope that Browning comes into this game with a sizable chip on his shoulder and the goal to open a few eyes. That could provide a much-needed game changer. One quibble….In 2016, the band (“The band, Elwood, the band!”) wasn’t at those games. School wasn’t in session yet, so it was the always loveable alumni band.